Legacy, an anti-smoking organization, has long advocated against tobacco use in film. Legacy, an anti-smoking organization, has long advocated against tobacco use in film. It launched the "Redefining Cool" initiative in February to address smoking on TV for the first time. It focused on how tobacco use on top-rated prime-time programs impacts teens, explains Julia Cartwright, SVP of communications for Legacy, which handled the PR effort in-house. Legacy timed the launch of "Redefining Cool" in advance of the 2011 Academy Awards. "We thought it would be an appropriate hook," she adds. "It is the first time we've turned our sights on smoking and TV." The team also publicly spoke out against smoking in Rango, the animated motion picture released in February. Legacy conducted a study, published in early February in the Archives of Pediatrics and Adolescent Medicine, that showed a "substantial amount of tobacco images" are found on TV programs often watched by 12- to 17-year-olds. 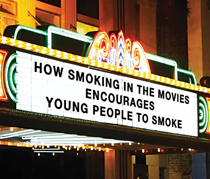 "Images of smoking in film in- creases intentions on the part of youth to try," adds Cartwright. Legacy rolled out an effort with actress Daryl Hannah, who voiced a video used to educate young filmmakers and film students about social responsibility in filmmaking. It also held a panel discussion at its Washington headquarters featuring Ursula Bauer, director of the CDC's National Center for Chronic Disease Prevention and Health Promotion, and Cicely Gilkey, a producer for a Mad Men documentary on the history of cigarette advertising. The campaign earned coverage in Fast Company, IMDb.com, Reuters, and Yahoo News. The webcast for the panel discus-sion was watched by at least 200 people and attended by about 100, says Cartwright. Legacy's efforts to address smoking on TV will be ongoing. It will also continue to push the videos in film schools.